In April of 1998, the Grand Rapids Press ran a front page series on the “generosity” of Amway’s two founders, Rich DeVos and Jay Van Andel. What follows is the response from the independent newspaper, The Fundamentalist in the summer of 1998. 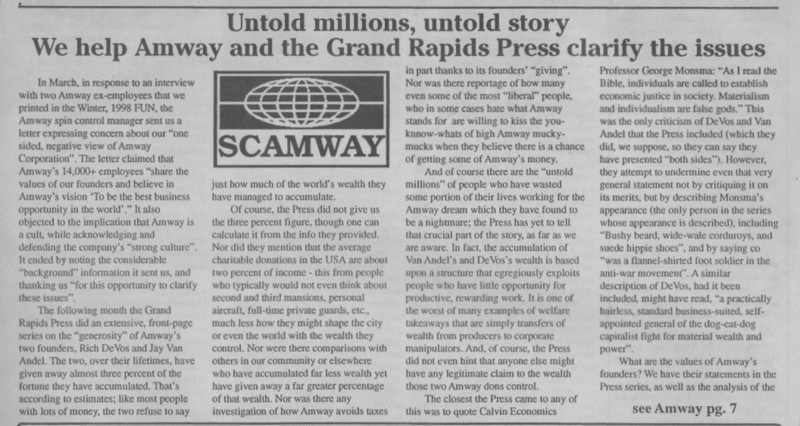 To read the entire article from 1998 that critiques Amway and the GR Press coverage, click here. This entry was posted in Anti-Capitalism/Labor, Indy Media, Religious Right and tagged Amway, the GR Press and Amway. Bookmark the permalink.